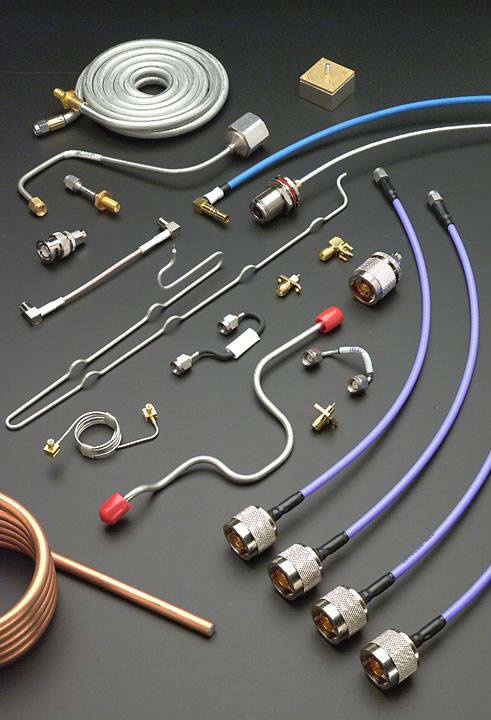 EZ Form Cable’s primary products are miniature semi-rigid coaxial cable, semi-rigid and flexible cable assemblies, coaxial delay lines, and coaxial RF connectors, supplied to customers throughout the microwave industry. Applications include High Speed Computers, Space Applications, Microwave Components, Low-Noise Amplifiers, Wireless/Cellular Systems. Cable uniquely bends to finished shape and maintains its set after bending. This property makes it ideal for use with automated bending equipment or hand forming. EZ Form cable is qualified to MIL-DTL-17 and is listed on the U.S. Defenese Logistics Agency QPL Cable diameters range from .020″ to .325″. EZ Form also manufactures the EZ-Armored “Ruggedized” Cable series. These cables incorporate flexible high performance cables with a nearly indestructible covering. EZ Form AL is the first aluminum-jacketed semi-rigid cable to be granted MIL-DTL-17 qualification. ALso, EZ FLex 250, 141, 86, 47 and EZ Flex 401, 402, and 405, truly flexible cables with the performance of MIL-DTL-17 semi-rigid.